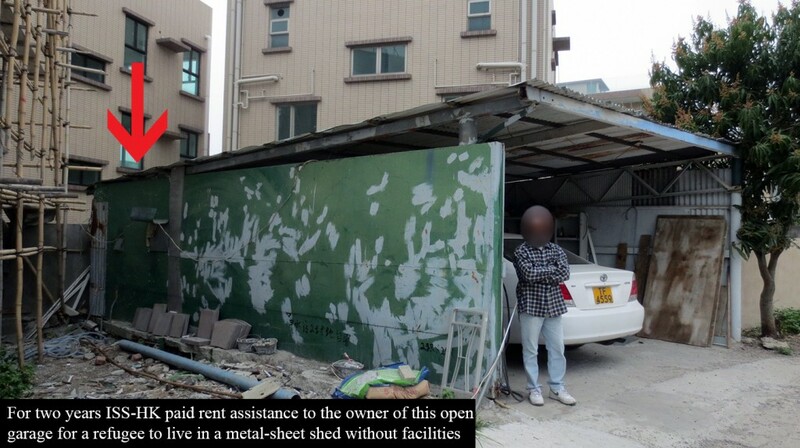 It needs to be considered that the way in which Hong Kong’s Social Welfare Department (SWD) treats refugees can lead to refugees committing criminal acts. This will be explained by defining and discussing the criminological theories of opportunity and labelling and explaining how current SWD policies might lead refugees to commit criminal acts. Opportunity theory can be defined as, “offenders having inadequate or inappropriate means or opportunities to achieve certain goals relative to other people in society” (White, 2014, p. 71). 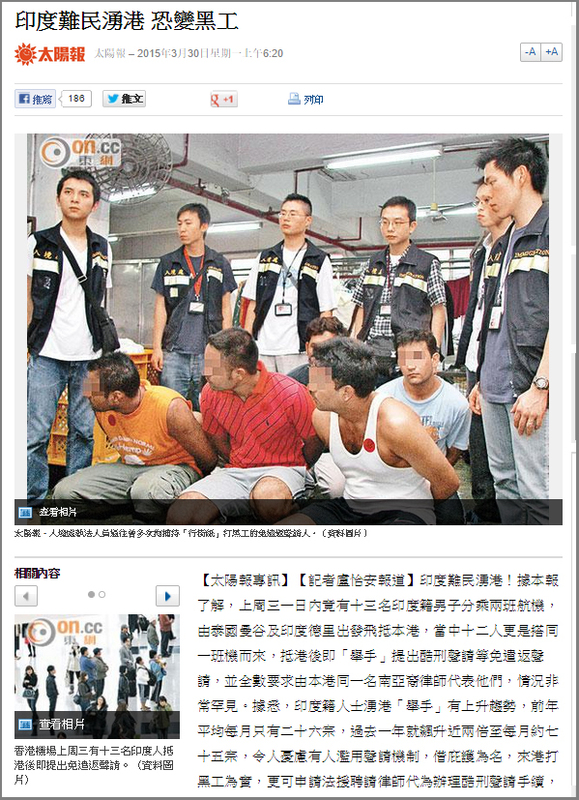 Considering refugees in Hong Kong using this theory, it can be argued that crime is generated by this type of treatment. For example, if refugees don’t have adequate means of living and opportunities to better themselves through education and work, there is a chance they will try to better themselves through ‘illegal’ activities such as work performed without authorization. As reported in the South China Morning Post, “asylum seekers awaiting the outcome of their claim with the Office of the United Nations High Commissioner for Refugees (UNHCR), recognised refugees awaiting resettlement to another country and torture claimants are banned from doing paid or unpaid work” (Chan, 2013). Looking at this through opportunity theory, it can take years for refugees to be screened and possibly resettle in another country and, while waiting, they cannot work to better themselves and earn money for their family. Using this example there is a likelihood that if a refugee family needed money for rent, food, clothes or the children’s school and if the only way to achieve this was stealing or working illegally, they would have no choice but to commit criminal acts to meet what most people would agree are basic daily needs, in this case, unmet by the SWD. Labelling theory can be described as society labelling an individual, which in turn can cause the individual becoming influenced by the label and acting out that labelled behaviour (Holmes, 2012, p. 250). It can be argued that refugees can be stigmatised due to the current system and laws in place. For example, refugees can be seen by the Hong Kong public as being dependant on the SWD and not searching for jobs, as they are not aware of the current government policies which prohibit them from working. This type of stigmatization can cause refugees to be always seen by the public as individuals who are content being dependant on welfare and not wanting to work. This can lead to refugees believing social change will never occur and becoming influenced by the label and turn to conducting criminal acts such as theft and working illegally. In conclusion, as shown through the criminological perspectives of opportunity and labelling, the current policies of the HK SWD can cause refugees to commit criminal acts due to them not enjoying adequate support and being labelled by the general public as continuously dependant on welfare and not looking for employment. To create a stronger relationship between refugees and the government, refugee policy needs to change to minimise the potential of criminal acts being committed by refugees trying to meet rent payments, purchase essential foodstuffs and making ends meet. The Unified Screening Mechanism may as well be said to have failed in keeping up with its promise of protection, remarked a senior lawyer at a Vision First meeting this month. He was of the opinion that the administration mismanaged the process to such an extent that fair-minded observers would not consider it a success, if not for rejecting 99.9% of asylum claims. The big picture is alarming. USM was expected to finally process claimants, whose numbers hovered around 5000 for years. But in 2014 the number doubled to 10,000, with new claims lodged at more than 300 per month. This surge surprised the administration that expects a considerable rise in screening costs, welfare assistance and the publicly funded legal scheme. 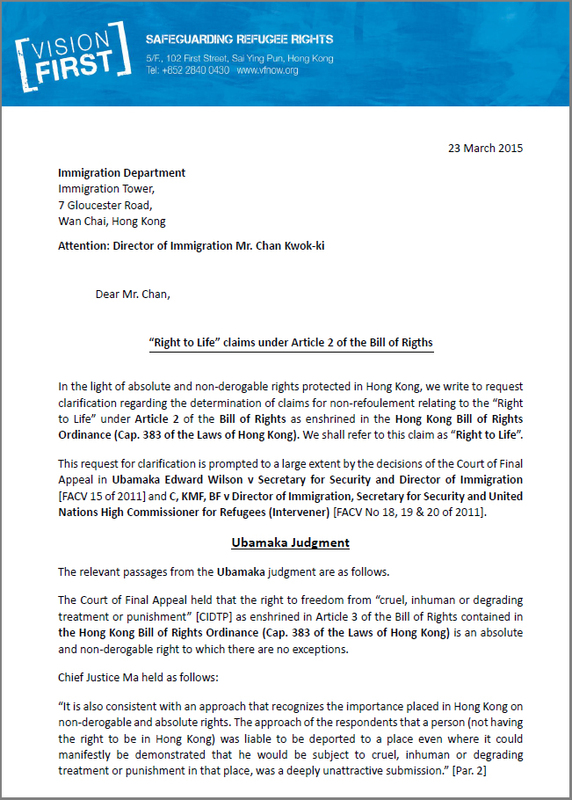 The backlog of claims is expected to increase further as refugees becomes familiar with the “Right to life claim” (BOR 2) which requires that asylum bids be also assessed on grounds relating to Article 2 of the Hong Kong Bill of Rights Ordinance, which is binding on the Immigration Department. 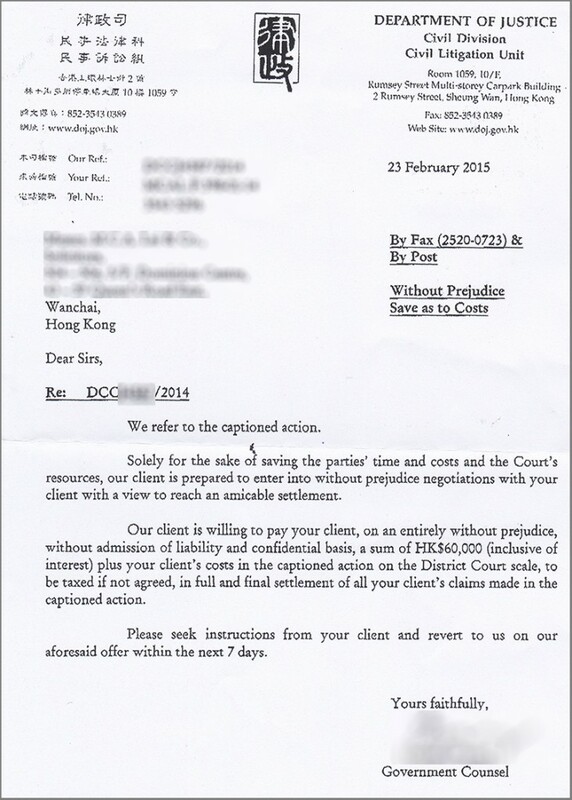 From documentation acquired by Vision First and freely available on the LegCo website, it seems that rather than reviewing an asylum system, that seems to neither protect nor uphold refugee rights, the administration is considering fast-tracking screenings, affecting legal safeguards. However, placing departmental expediency and completion targets ahead of obligatory “high standards of fairness” will pave the way for extensive judicial reviews, warned the HKBA. If the administration’s approach to screening and determination is cause for alarm, the welfare side is of little consolation. It should be pointed out that hundreds, if not thousands of claimants have been in limbo for years without adequate welfare or employment rights. Such unfair treatment inflicted unjustified hardship on already vulnerable persons who hoped to find sanctuary in Hong Kong. Instead of protection, refugees experience rejection through countless difficulties that hamper their daily existence. It takes months to obtain assistance, during which time new arrivals are often left hungry and homeless, fending for themselves in the streets. “We signed the contract with ISS but cannot find a place for 3000$. Without a room ISS only provide dried food like biscuits, instant noodles and canned food!” lamented an African couple who has slept on a sofa-bed at Vision First for several weeks. The mismanagement of food rations continues despite refugees vociferously protesting for more than a year. There might be a widening rift between the SWD and ISS-HK that exposes a communication problem, to put it gently, relating to millions of dollars in food allowances that failed to reach the plates of destitute and hungry refugees. “Where is the remaining money” questioned Cable TV. The 69 refugee slums exposed by Vision First are emblematic of the faltering asylum system. As a matter of fairness and humanity, it is reasonable to expect that the slums be wound down gradually without mass evictions that cause preventable homelessness. To the contrary, the same indifference to the wellbeing of refugees manifested in the establishment of slums, is blatantly obvious in their abrupt closure without offering basic, functional and safe accommodation. Vision First reports that for almost a year some progressive legal professionals advised refugee clients to raise a “BOR 2 claim” together with their protection bids against torture, cruelty and persecution as prescribed under the Unified Screening Mechanism (USM). HKBOR Article 2 (“BOR 2”) is a broad safeguard protecting the “right to life”. In brief, it defines that sentences of death may be imposed only for the most serious crimes and ought to be carried out pursuant to a final judgment rendered by a competent court. Anyone sentenced to death shall have the right to seek pardon or commutation of the sentence. Put simply, every human being has an inherent right to life which can only be forfeited in the administration of justice by a legitimate court that includes an appeal process. Amnesty of the sentence of death may be granted in all cases. It follows that no person can be unjustly killed, summarily executed, or fall victim to extra-judicial killing without legal proceedings. 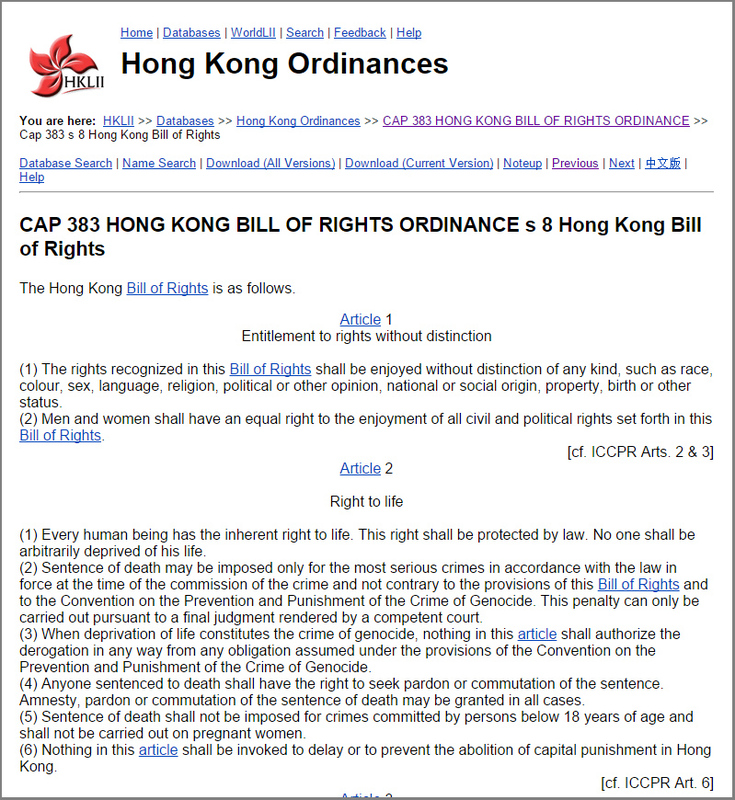 The Hong Kong Bill of Rights is binding on all public authorities. 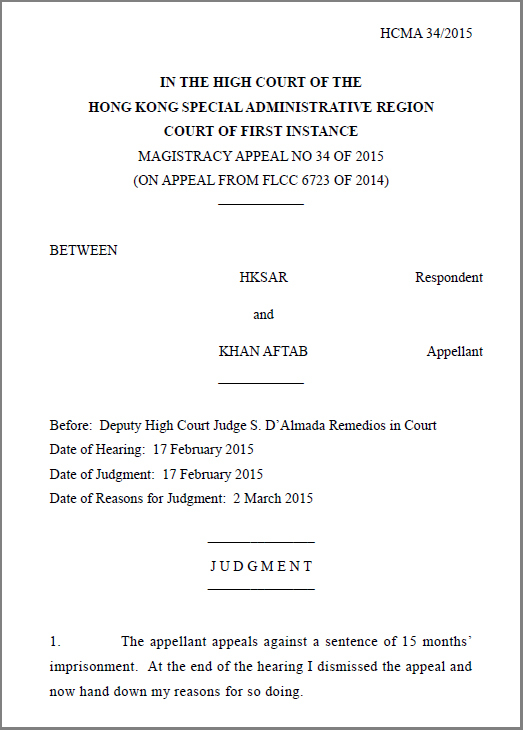 In particular, the Court of Final Appeal found in the “Ubamaka judgment” (FACV 15/2011) that it may be unlawful for the Director of Immigration to exercise his discretion in favour of deporting refugees who might face arbitrary deprived of life – a deeply unattractive prospect contrary to article 2 of the Hong Kong Bill of Rights. In light of USM having rejected 99.9% of claims in 2014, Vision First advises refugees to consider including the BOR 2 claim in their letters to Immigration raising asylum claims. By reserving the right to be screened for a risk of arbitrary deprivation of life, claimants have additional grounds of non-refoulement protection other than the three prescribed grounds. Vision First reports that currently the Immigration Department will in most cases stay claims (whether at screening or decision stage) once claimants reserve the right to be assessed also for BOR 2. To date Immigration has not indicated in writing what their stance is regarding this new claim. This has the practical result of putting on hold such asylum claims until the USM is expanded to include an assessment for the arbitrary deprivation of life. Consequently, the 826 refugees who had USM claims rejected at appeal in 2014 could theoretically lodge BOR 2 claims with the Immigration Department. 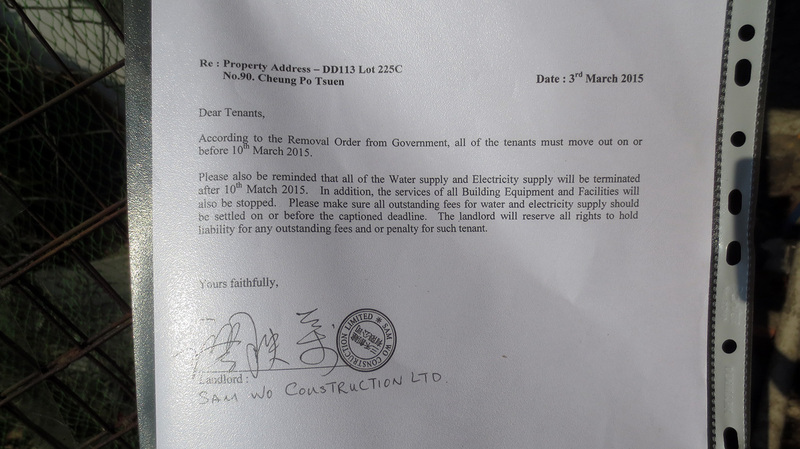 It is reported that from 11 March 2015 detainees in Castle Peak Bay Immigration Centre will be permitted to file BOR 2 claims. 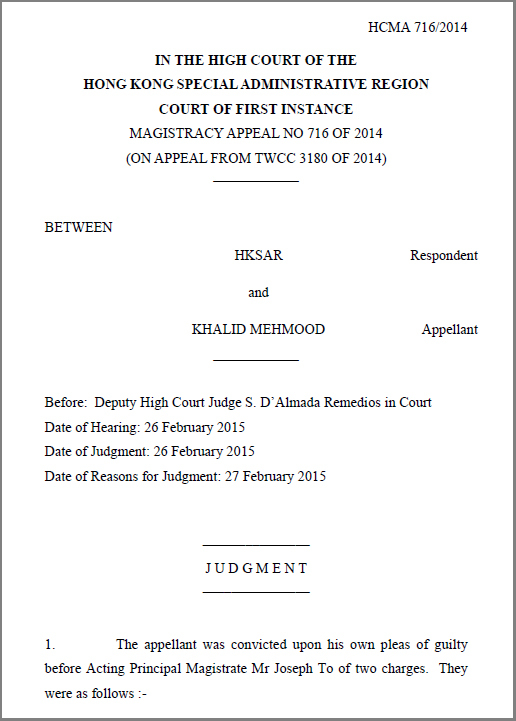 Should victims of unlawful detention settle for half damages? 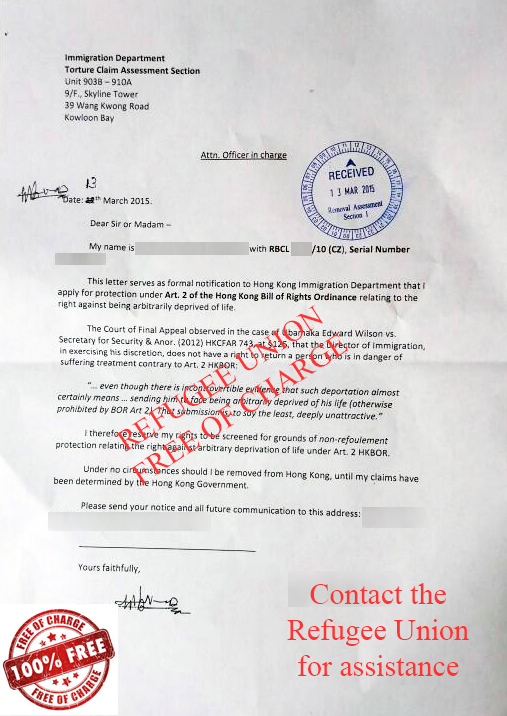 Refugees have every right to seek sanctuary in Hong Kong where the domestic legal framework makes overtures of asylum protection to individuals fleeing torture, cruel inhuman degrading treatment and persecution. Whether claims are eventually substantiated or not by the Immigration Department is entirely a different matter. Vision First advances the view that every claimant must be treated with utmost respect and every claim must be approached on the premise that it is genuine unless and until it is proven that it cannot be substantiated by the claimant with recourse to proper legal remedies, if necessary. It is regrettable that immigration detention is utilized to discourage the lodging of claims, the pursuit of asylum bids, arguably to encourage the voluntary departure of those persons who are daunted by the punitive and hostile reception. Such techniques, if widespread and arbitrary, are insensitive to the experiences of those seeking asylum and are contrary to the spirit of asylum. Protracted detention deprives claimants access to information and opportunity to purse their claims with the assistance of independent legal advisors. Prolonged detention pending determination of claims is contrary to the principle that a person can only be detained for a period that is reasonable in all the circumstances for the purpose of effecting removal or deportation. 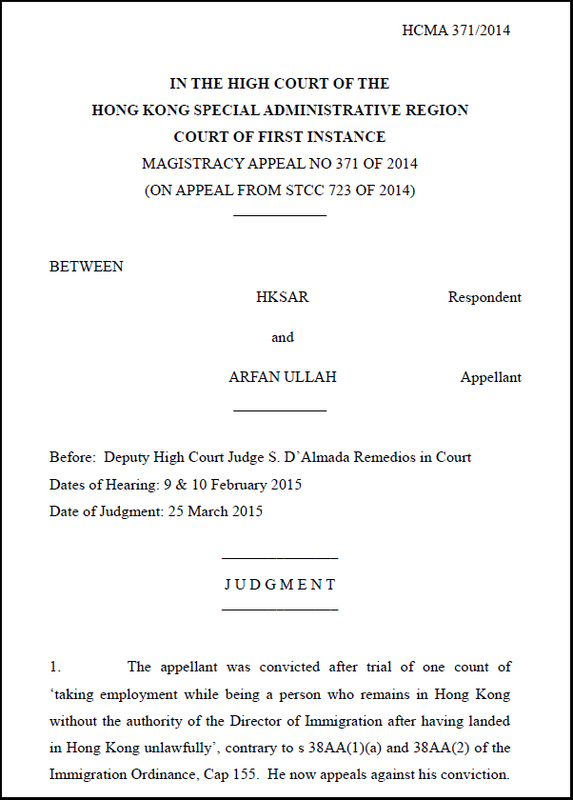 On 17 March 2014, Vision First reported the landmark case of Mr. Ghulam Rbani, who won a Court of Final Appeal case (FACV 15/2013) against the Director of Immigration for damages for false imprisonment, claiming that he had been unlawfully detained at the Castle Peak Bay Immigration Centre (CIC). Simply put, the judgment opened the way for similar plaintiffs to be compensated with 1000 HK$ a day for the deprivation of liberty after lodging asylum claims. Vision First is of the view that all claimants who were detained longer than 4 to 6 weeks in CIC should seek compensation not only as personal reparation for unlawful imprisonment, but particularly to discourage the arbitrary detention of those who trust Hong Kong government to protect them from torture, abuse and persecution. In light of the above, the below letter by the Department of Justice raises questions. The plaintiff was allegedly unlawfully detained for 120 days and rightly demanded 120,000$ in compensation. 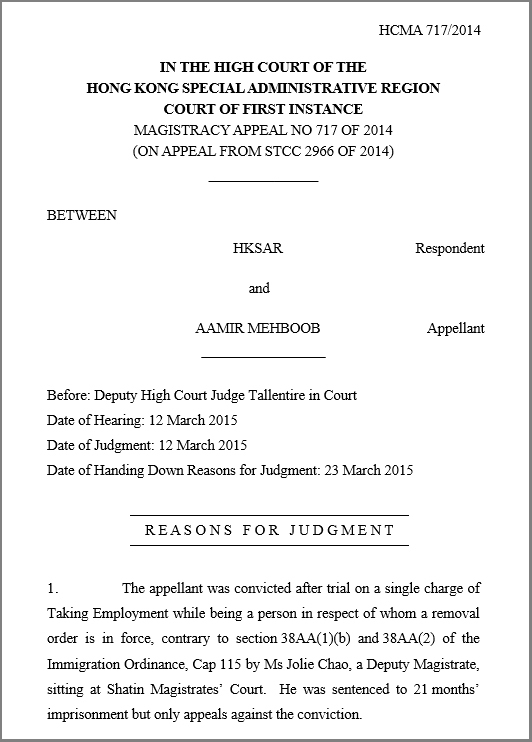 The claimant laments, “When I was in CIC, [Immigration officers] gave me pressure every day to go back to my country. But I told them I am waiting for CIDTP case. I cannot go back because of danger.” The authorities are haggling over the price of injustice and offered half the amount. Why should victims of unlawful detention settle for 50 percent?